For some reason, Jack came home one day last week, drew a smiley face on a piece of paper and taped it to the May 16th square of our calendar. He proclaimed that day to be King Jack Day. Today, in fact, was King Jack Day because today is the 7th anniversary of Jack's birth. Some of you might refer to these types of days as "birthdays." 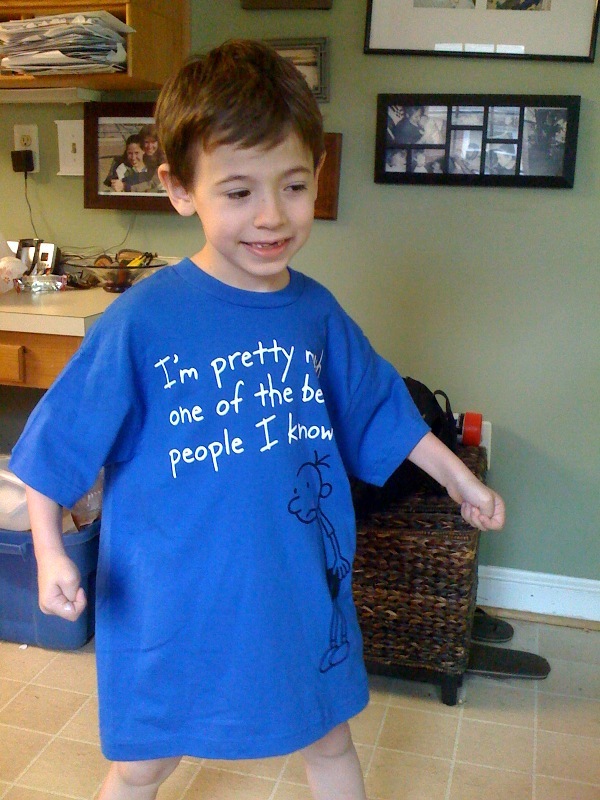 Jack in his new dress t-shirt. He's pretty much one of the best people I know too. I don't know what it is about age 7, but Jack seemed so big today. It started when he was so excited to take his big bag of cupcakes to school to share with his class. I don't remember what I did last year, but I do remember worrying about them not making it into class. Today I felt like I could trust Jack. Today he was excited to share the cupcakes with his classmates. Today, he seemed coordinated enough to get the bag to his classroom without dropping it. Today he seemed like a big kid. We also have a long history of struggling with present unwrapping skills. Usually he unwraps one and wants to play with it, ignoring all the others. Sometimes he will just fixate on the unwrapping without much seeming thought to the contents. Generally he doesn't seem too intrigued by the gifts until it's time to open them. 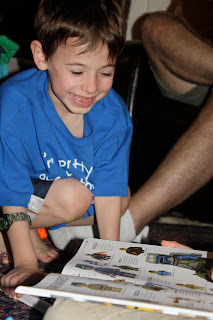 Today he asked several times if he could open his gifts. Sadly he had to wait until Alex got home at 6 p.m. We are totally the meanest parents on the face of the earth. He was really excited. And even though the thing he wanted more than anything else was magnets, he was able to take time to appreciate his other gifts as well. Dudes. Go out and buy The Lego Book immediately. It's way cool. Because I am a sucker for Jack's little, hopeful face, I bought him magnets for his birthday after he first expressed interest in them a couple of weeks ago. Actually, I asked him what theme he wanted for his birthday. Without hesitation, he said, "Magnets." He's been obsessing on them ever since. The purchasing of copious amounts of magnets arguably makes me the coolest mom ever, but it inarguably makes me the dumbest mom ever, considering that Jack regularly puts small, metal objects in his mouth. I am well aware of what will happen if he swallows two of them. I am also well aware of what will happen if any of these magnets end up near my electronics. We had a long conversation about proper usage of magnets and how if you use them wrong YOU COULD DIE! and if you put them on mommy's computer YOU WILL BE KILLED! I think I was pretty clear. These magnets are pretty much a death sentence for (a) Jack, (b) my computer. Even with the danger of imminent death and the rampant destruction of my beloved electronics, how could I resist bringing science-y items into my little House o' Nerds? You should have seen Alex's face when he saw the little vial of iron filings. He's probably already planning experiments. Do you see how I'm all, "Oh those nerds," as if I weren't one? Alex keeps threatening to start up a "The Truth Behind Stimeyland" blog where he will call me out on all these misdirections. I made a cake for Jack, put his name on it, and left Sam in charge of distributing about seven pounds of sprinkles. Wait 'til you see his birthday party cake, complete with magnet decorations. All in all, this was not a bad way to celebrate King Jack Day. My kiddo is growing up. I can't quite believe it. Happy Birthday, Jack! I like how you differentiate the two dangers (Die! Be Killed!) - totally. He does look big...but still adorable. Were Magz (those magnetic bars and balls) among the magnets you bought? They were MY nerds' favorite plaything for ages. Happy Birthday to his royal highness! That face--what a smile!!! I love that t-shirt too!! Happy Birthday Jack! Imminent death, Legos, and birthday cake. Awesome! Happy King Jack Day! What a great birthday. And what a great mom you are. Awesome! Happy Birthday, King Jack. Happy Birthday Jack! RIP stimey's computer! Happy Birthday to King Jack! I absolutely love that shirt! I must have 1, or 2, okay, make it 3! Magnets are definitely a cool nerd toy! Not that I would know. Nope, not me at all. Great Shirt! Happy "King Jack Day" to your little man! Our youngest has a thing for magnets too, we got him a set of toys called Magnetics - they're little steel balls with a bunch of multi colored magnetic bars to stick to them. they are very cool toys, and quite possibly my son's favorite thing in the world. Big love to King Jack! Joseph has that same shirt! He usually wears pant with his though. And he has that Lego book! Happy Birthday King Jack! You're one in a million and the cutest nerd I've ever "met".